SpLD: SpLD appointments are available at WSA on Tuesdays (term time). Study Skills Support: A Study Skills Support drop in is available on Tuesdays at WSA, 1:00pm - 2:00pm in Room A2025. Come along for quick practical study advice and support, no appointment necessary. First Support: First Support provide support to students experiencing significant difficulties. To arrange an appointment at WSA call 023 8059 7488 or email firstsupport@soton.ac.uk. Counselling: Short term counselling is available at WSA by appointment on Fridays. Please contact Enabling Services for a triage form if you would like to be considered for counselling. Take the shuttle bus to Highfield campus to access Enabling Services Drop-in, Mon - Fri (term time) and Mon, Weds and Fri (vacation period), 1:00pm - 3:00pm, Enabling Services, Building 37. The shuttle bus service is free on presentation of a valid student ID card, full details can be accessed here. Have a quick question? Want to find out more about Enabling Services? 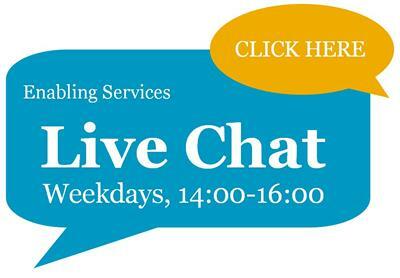 Live Chat is available between 2:00pm - 4:00pm, Monday - Friday. Click the chat icon below to chat now! Live chat with us today! Enabling Services are able to offer a range of appointment options: Face to face, telephone and Skype. Skype appointments are helpful if you are not able to visit Highfield Campus or based elsewhere during your studies.